The U.S.S. 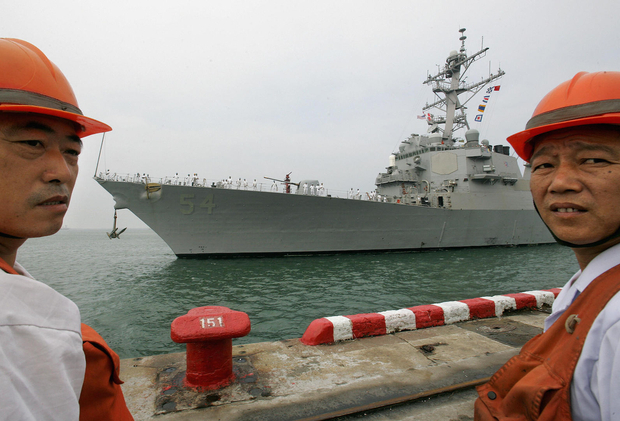 Curtis Wilbur, an AEGIS class guided missile destroyer, in Qingdao, in eastern China's Shandong province in September 2005, when delegates gathered in Beijing for resumption of the North Korean nuclear talks. Last Saturday, January 30, 2016, this same vessel sailed within 12 nautical miles of Triton Island in the South China Sea, provoking Chinese official protest. China has criticized the recent U.S. Navy operation sailing within what it considers its territorial waters in the South China Sea as needlessly provocative. In China’s view, the U.S. Navy has purposely inflamed tensions in the region in order to stir up opposition to China. While it is true that tensions have risen, and probably will continue to increase, in the South China Sea region over the past few years, the “freedom of navigation” operations (FONOPs) that the U.S. has conducted cannot fairly be blamed for either creating or increasing these tensions. Why? First, it is important to keep in mind that the FONOPs like the one China recently protested are part of a U.S. Navy policy that has been carried out all around the world since at least 1979. China is hardly the only country that has been the target of these operations. According to the U.S. Department of Defense, in 2014 the U.S. conducted similar FONOPs challenging excessive maritime claims by countries as diverse as Argentina, Brazil, Ecuador, India, Indonesia, Iran, Libya, Malaysia, Maldives, Nicaragua, Oman, Peru, the Philippines, Sri Lanka, Taiwan, Venezuela, and Vietnam. During that same year, the U.S. also conducted numerous FONOPs targeting excessive Chinese maritime claims along China’s mainland coast. But China’s Foreign Ministry did not condemn those FONOPs with the same heated language it is using today. Nor did Chinese state media attack those earlier U.S. actions as “provocative.” It is China, and not the U.S., that has transformed these relatively routine operations into a source of bilateral and regional tension. Second, the U.S. FONOPs do not in any way challenge China’s territorial claims in the region. Rather, the U.S. has stated repeatedly that the FONOPs are intended only to protect the “freedom of navigation” guaranteed under international law. Thus, the U.S. made clear that when its naval ships recently sailed within 12 nautical miles of a Chinese-claimed island or land feature, those ships operated under the rules of “innocent passage.” This phrase, codified under Articles 17 and 19 of the United Nations Convention on the Law of the Sea, guarantees “ships of all States” the right to pass through a territorial sea as long as that passage is not “prejudicial to the peace, good order or security of the coastal State.” In practical terms, this means the U.S. naval ships conducted a transit with all of its military capabilities (such as fire control radars and other weapons systems) shut down. Indeed, by limiting its transit to “innocent passage,” the U.S. is actually giving a great deal of respect to Chinese territorial claims (perhaps more than they actually deserve). For this reason, it is more likely that China, and not the U.S., is the main cause of increased tensions and potential conflict in the region. Most prominently, China has sharply increased its presence by building artificial islands on top of reefs or underwater land features claimed by other countries in the region. It has also increased its use of state-owned coast guard ships in the region to expel non-Chinese fishermen from its claimed territorial seas. The execution of a standard U.S. naval program that has been in operation for nearly 40 years, and which does not even specifically target China or its territorial claims, seems pretty minor by comparison. On Monday, February 1, however, a different MoFA spokesperson provided a different description of China’s response, saying Chinese troops and naval ships immediately identified the U.S. destroyer and swiftly warned and repelled it. This new description is identical to the one provided by the defense ministry in its public response to the sail and may have simply borrowed. It is possible that the Foreign Ministry’s initial description of Chinese response was inaccurate because it was not as privy to what happened on the front lines as was the Defense Ministry, although this would suggest a troublesome lack of coordination between the two ministries in managing the South China Sea situation. A more plausible explanation, however, is that the Foreign Ministry was compelled to provide a stronger narrative of China’s response because nationalistic voices inside China are already criticizing the government for being too soft. Yet, the stronger response of “warning and repelling” in fact revealed China’s relevant restraint. Such restraint was also displayed last October in its “monitoring, tracking, and warning” response to the U.S.S. Larsen’s FONOP sail near Subi Reef in the Spratly Islands. In neither case did China’s naval or coast guard vessels try to intercept or ram U.S. ships. Chinese restraint is good news for regional peace. Beijing is sending the message that it doesn’t want a fight with the U.S. over these operations. But at the same time, it is deeply unhappy with U.S. military assertions. And, under mounting nationalist pressure, there is no guarantee that Beijing will be able to maintain restraint in responding to future FONOPs. If the U.S. continues to press China without at the same time showing conciliatory gestures, Beijing may come to the conclusion that it has no choice but to arm the islands in order to fend off U.S. threats. China has no problem with freedom of navigation as a general principle of conduct at sea. But it has a big problem with FONOPs as a U.S. military policy. Who gives the U.S. the right to use military power to enforce its own interpretation of freedom of navigation? Is military power really the best way to safeguard freedom of navigation? Who should be responsible in the event of conflict? These are all legitimate questions China—and many other countries—can ask about FONOPs. The U.S. should seize the current window of opportunity offered by Chinese restraint and start a serious strategic dialogue with China over freedom of navigation in the South China Sea. Further muscle-flexing may have tragic consequences. The United States Navy certainly has made good on its recent declaration to send a warship to the South China Sea on a frequent basis. In October 2015, one U.S. Navy destroyer sailed within the 12 nautical miles of Zhubi Jiao (Subi Reef, in English) near the Spratly Islands. Then, in January 2016, another U.S. warship made a similar voyage, passing Zhongjian Dao (Triton Island). A routine seems to have taken shape. The United States publicizes its actions, calling them “freedom of navigation operations” (FONOPs). China reacts by tailing the U.S. ship and launching a verbal protest. Scores of reefs and islands dotting the South China Sea are left for such a routine to repeat itself. It is just a matter of time before we hears news of the next round of exchanges between the United States and China. Among the many possible questions to ask is this: What point does the action and, in particular, its publicity, serve? Some say it is a matter of international law. Well, Chinese law asks foreign warships to seek prior approval if they wish to conduct “innocent passage” through its territorial waters. This is allowable in international law, at least in terms of state practice if not explicit wording. China is among the minority number of states around the world that adopt such practice, but is not an outlier. The United States does not like to have to observe such pre-conditions for sailing about. And, the U.S. claims that it is not singling out China. There is validity in these arguments, as Julian Ku says above. What results, then, first and foremost, is a contest of diplomatic resolve. Neither side seems ready to blink first. Does the contest escalate tension in the South China Sea? It is a matter of perspective. When both the U.S. and Chinese navies observe the routine, the exchange does not amount to anything more than what we have already witnessed. The true test can and will arise if either party takes a step further. It is, therefore, important for both the United States and China to strictly abide the ongoing pattern of conflict avoidance. Meanwhile, it would be useful if the United States opted to give the same publicity to each and every naval operation of the same nature and purpose conducted around the globe as it does to those it conducts in the South China Sea. That would be helpful to assuage Chinese suspicion that the U.S. may, in reality, be aiming at more than it publicly says in areas Chinese, contested or not. Last but not least, both the United States and China have a salient question to address: What else can they each do to maintain the South China Sea as an area of safe passage—both technically and psychologically—for the numerous other users around the world? If media reports are accurate, the U.S. military conducted a demonstration of the U.S. position on aspects of international law, and the Chinese authorities demonstrated their objection through words. Unless significant details have yet to emerge, this U.S. “freedom of navigation” (FON) operation was not a close call when it comes to war and peace, or even a minor crisis. In this case, notwithstanding heated language from the Chinese side, there is no indication U.S. and Chinese forces were ever operating at close proximity. Even if they were, the potential for incident is far greater if, as the Chinese fighter was accused of doing, one or both sides breaks from norms of safety in the air and at sea. The Chinese reaction in this case seems to be about as measured as could be expected. The U.S. government should not, however, assume Chinese authorities will show the same restraint in all cases. If, as expected, the FON program continues in the South China Sea, U.S. officials should expect intercepts and the possibility of unsafe encounters. This risk is increased because, despite the military-to-military work on safety in unplanned encounters, not every Chinese ship in the area is part of the Navy. This second FON operation sent a far clearer message than the October transit near Subi Reef. A U.S. spokesperson promptly described the legal point the mission was to demonstrate. It remains an open question, however, whether the U.S. government needs to send warships to make its legal point. If the United States would ratify the U.N. Convention on the Law of the Sea, it could use dispute resolution mechanisms under the convention. Even without ratification, consistent diplomatic statements and documentation can make a strong representation. It is clear, however, that the U.S. missions are not just about making a legal point. They are also a show of force, and they help satisfy a constituency inside the U.S. policy community pushing for the White House to “do something” about China’s island construction. But what do FON operations “do”? Their goals and effects should be debated just as ferociously as the legal positions they advocate. Between 2008 and 2011, India and China went through one of their worst patches regarding their long-standing border dispute and bilateral relations in general. New Delhi noted this rough patch roughly coincided with a time Beijing escalated its territorial disputes with Japan and the states bordering the South China Sea. Today, of these three territorial disputes, Beijing continues to pursue only the South China Sea aggressively. The Sino-Indian border is largely quiet. Even the seas and skies around the Senkaku/Diaoyu islands are less boisterous. At various fora, including East Asian Summits and bilateral meetings with the United States and various Southeast Asian states, New Delhi does not support China’s claims to the South China Sea. Privately, Indian officials draw comparisons to China’s takeover of Tibet. Publicly though, New Delhi expresses this view in indirect statements supporting the “freedom of navigation” and disparaging the “expansionist” tendencies of certain Asian countries. It has also expanded military relations with Vietnam and other states of the region. One simple reason is that India knows that when it comes to tangible power, the areas east of the Malacca Straits are well beyond its abilities. “We will defend the South China Sea to the last Filipino or Vietnamese,” is how some officials half-seriously describe the policy. One is gauging the United States commitment to defending its influence in the Asia-Pacific from China. New Delhi is less than enthusiastic about the Obama administration and its weak response to China. It is pleased that China’s conversion of atolls into airstrips has triggered a stronger U.S. response in the form of aerial and naval movements through the areas China claims. New Delhi will watch with interest how the next U.S. administration responds to the South China Sea question. Two is how China’s moves are shifting the geopolitical stances of countries in the Southeast Asian and Oceania regions. New Delhi has been alarmed at the inability of the Association of Southeast Asian Nations to forge a united front against China on the South China Sea. Three, partly because the irritation many of the U.S.’s Asian treaty allies have expressed at Washington’s China policy, India is also slow pedaling in its own strategic engagement with the U.S. New Delhi has noticed how, for example, the U.S. has struggled to rally its Asian treaty allies to follow in the trail of the U.S.S. Lassen, which in October sailed near the contested Subi Reef. None of America’s Asian treaty allies have signed up, despite requests from Washington. New Delhi believes this to be the fallout of the Obama administration’s past seven years of vacillation over policy towards China. India has been similarly cautious in supporting the U.S. Though New Delhi has sought to buttress a hardening U.S. policy towards China, it has done so only rhetorically. Even the joint Indo-U.S. “strategic vision” of the Asia-Pacific issued in 2015 only iterated earlier formulations India had made. India cannot and will not move closer to China. But by treating the South China Sea as a symbol of the U.S.’s commitment to Asia, India automatically puts the brakes on its evolving strategic relationship with the U.S. Under the George W. Bush administration, the worldviews of the two largest democracies led them to expand areas of convergence. Under Obama, this process has regressed. India is hostile to U.S. policies in southwest Asia, verbally supportive in the western Pacific, and only positive about U.S. policies in the Indian Ocean region. How the U.S. reacts to Beijing’s tightening grip on the South China Sea in 2017 will be a key determinant of the Indo-U.S. relationship in the coming years.